Plus, first look at the launch edition bonuses. 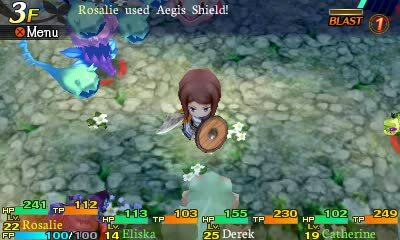 The latest Etrian Mystery Dungeon media blast further details the game’s pre-order and launch edition bonuses, as well as the Protector class. Launch edition copies of the game include a collectible outer box and the “Sights & Sounds of Mystery” visual book, which houses 28 pages of art and information and a “Rough Sketch Ver.” soundtrack CD. The Protector is a “battle tank” class with high defense, and uses its tower shield to soak up damage. They provoke enemies with taunts and ability binds, and are a key addition to the party in surviving against rare monsters and bosses. Also announced, Atlus is giving away an “Etrian Mystery Box” (what’s inside is a mystery) to a randomly selected winner. All you need to do is share this video on Facebook or Twitter to apply. Watch the trailer below. View a new set of screenshots and a glamour shot of the launch edition bonuses at the gallery.